100% stainless constant-diameter system for gas & diesel vehicles dramatically improves flow, slashing backpressure for cooler operating temps. Polished-stainless straight-through muffler (most apps) is sound-tested to produce a rich, authoritative note & eliminate the drone. Huge polished tip. You expect an aftermarket exhaust system to deliver certain features: dramatic reduction in backpressure, rich sound, a perfect fit, and enhanced performance. 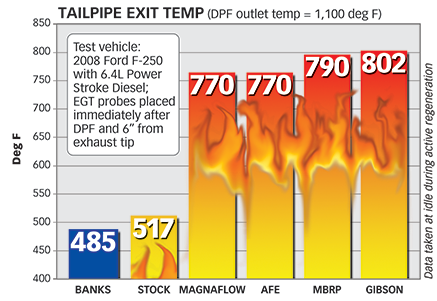 But for today’s DPF equipped trucks, there’s an additional factor to consider and one of critical importance: Tailpipe exit temperatures. As your DPF cycles, extremely high temperatures are produced and conducted through your exhaust system. Our competition fails miserably to reduce outlet temps. Not Banks. Our CoolCuff® design extinguishes dangerous temps better than stock and is just plain arctic when stacked up against the other guys. 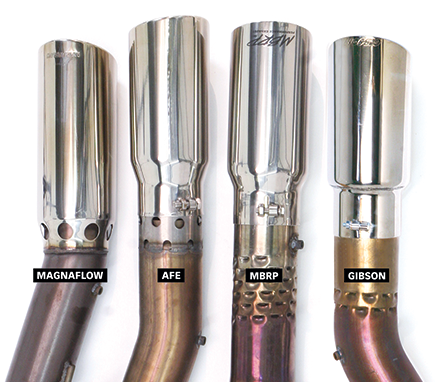 As your DPF cycles, extremely high temperatures are produced and conducted through your exhaust system. Our competition fails miserably to reduce outlet temps. Not Banks. Our CoolCuff® design extinguishes dangerous temps better than stock and is just plain arctic when stacked up against the other guys. Poorly designed systems. Blazing hot tailpipe exit temperatures and poor fitment. It’s hard to take these guys seriously when their “systems” vastly under-perform even the stock exhaust. Did they even bother to do any testing? Only Banks offers a truly engineered system. While the other guys may offer a replacement, Banks delivers total enhancement. Replacing the restrictive stock muffler with Banks’ free-flowing Monster muffler makes a huge difference in airflow, sound and performance. The Banks muffler has a big 4” inlet and 4” outlet. And in between, the exhaust flows straight through, instead of torturously winding its way back and forth inside hairpin chambers and building up back-pressure. 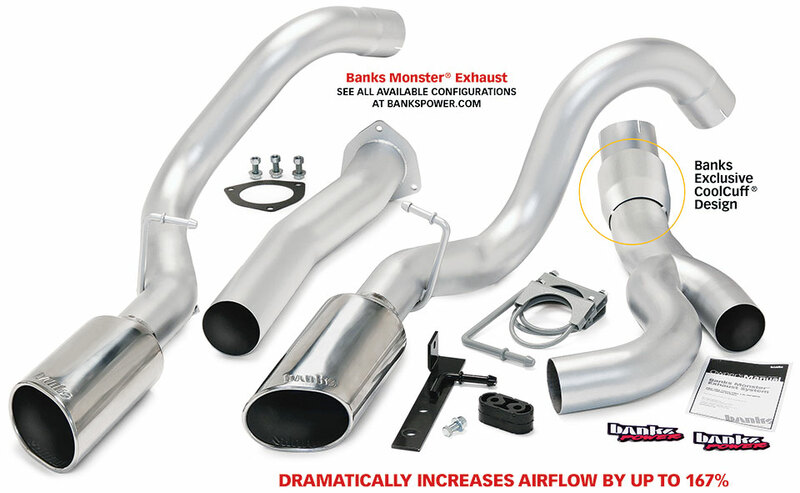 And only Banks Monster muffler has an expansion chamber to alleviate the nasty drone that other straight-through mufflers are known for. Banks utilizes durable ceramic packing with a high temp rating so it won’t degrade like fiberglass. Add it all together and you get a muffler that flows over three times better than stock and delivers a pleasing, throaty rumble! 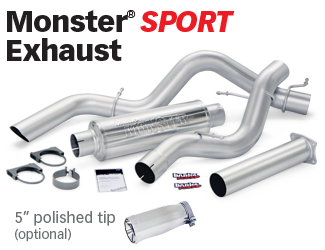 Check It Out —Banks Monster Exhaust is the solution that you are looking for.